AUTHOR INFORMATION: With eight collections edited for the University of Nebraska Press, Howard Andrew Jones is the acknowledged expert on historical fiction writer Harold Lamb. He has also written a number of short stories featuring Dabir and Asim which have appeared in a variety of publications over the last ten years, including Black Gate magazine, where he currently serves as the Managing Editor. The Desert of Souls is his debut novel, with Pathfinder Tales: Plague of Shadows to follow soon after via Paizo Publishing. PLOT SUMMARY: In 8th century Baghdad, a stranger pleads with the vizier to safeguard the door pull he carries, but is murdered before he can explain. Charged with solving the puzzle, the scholar Dabir soon realizes that the door pull may unlock secrets hidden within the lost city of Ubar, the Atlantis of the sands. When the door pull is stolen, Dabir and Captain Asim are sent after it, and into a life and death chase through the ancient Middle East. FORMAT/INFO: The Desert of Souls is 320 pages long divided over twenty numbered chapters. Narration is in the first person, exclusively via Asim el Abbas, the captain of Jaffar’s guard. The Desert of Souls is self-contained, but promises future adventures starring Captain Asim and the scholar Dabir. 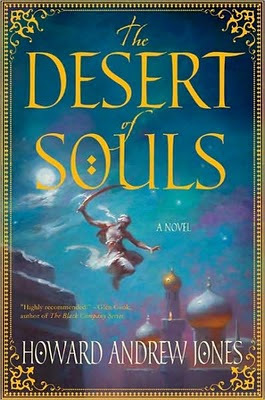 February 15, 2011 marks the North American Hardcover publication of The Desert of Souls via Thomas Dunne. 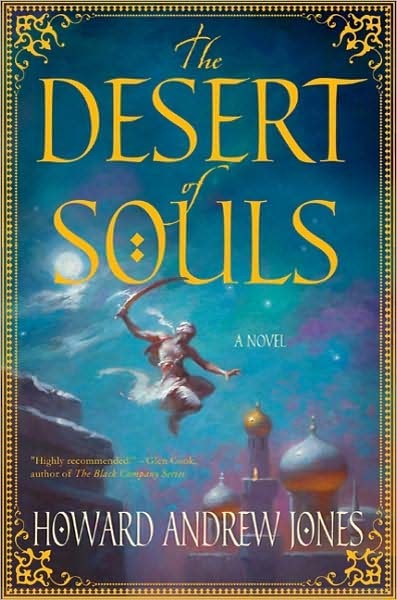 ANALYSIS: What immediately attracted me to Howard Andrew Jones’ The Desert of Souls was the following description: “A thrilling, inventive cross between One Thousand and One Nights and Sherlock Holmes.” Throw in comparisons to Robert E. Howard and a blurb by one of my favorite authors in Glen Cook, and I was completely sold. For the most part, the publisher and author blurbs had it right. The Desert of Souls is like an old-school Robert E. Howard sword & sorcery tale set against an Arabian Nights backdrop, complete with rousing swashbuckling adventure and dire magic. The Sherlock Holmes comparison is a bit misleading because of the novel’s lack of mystery, but Dabir’s cleverness and gifted intellect possessed more than a passing resemblance to the famous detective, while the relationship between Dabir and Captain Asim is not unlike that of the friendship between Holmes and Watson. Story-wise, The Desert of Souls is not going to win any awards for originality. Between a fortune teller, bandits, rescuing the kidnapped Sabirah, searching for treasure in a fabled city, the young woman who wishes to marry for love instead of political advantages, the villain seeking revenge, overcoming impossible odds and many other familiar ideas, The Desert of Souls is rife with tried-and-true fantasy conventions. Fortunately, it’s not the content that matters so much as the stylish manner in which Howard Andrew Jones tells the story, which includes energetic pacing, Asim’s engaging narrative voice, well-timed surprises, and a balanced blend of breathtaking action, witty humor and thoughtful insight. The magic in The Desert of Souls is also lacking in the creative department with djinn, a city of ghosts, an ancient feathered serpent, and sorcerers who can control fire or command the dead the most obvious examples—the Keeper of Secrets and its project is the main exception. Just like the story though, Howard Andrew Jones overcomes this shortcoming with his writing, specifically the exciting flair in which magic is woven into the novel. Honestly, I was surprised by how polished The Desert of Souls turned out to be, especially for a debut novel. Of course, after finishing the book, I learned that Howard Andrew Jones has been writing short fiction for several years now, and that The Desert of Souls is hardly the first time he has written about Dabir and Captain Asim. In fact, the author even incorporates one of his older short stories, “Whispers from the Stone”, into the novel. With this knowledge, it’s easy to see why The Desert of Souls was such a well-written novel. It also explain the author’s familiarity with Dabir and Captain Asim, which is evident by their undeniable likability, the convincing friendship the two develop, and the way they carry the novel. Negatively, the supporting characters (Jaffar, Sabirah, Hamil the Poet, Firouz, etc.) are one-dimensional, parts of the story could have benefited from tighter execution, and I wish greater detail had been used to explain some of Dabir’s actions and reasonings over the course of the novel. For the most part though, The Desert of Souls is the result of an author who knows what he’s doing. Thanks for this review! Avoids setting expectations too high while still letting me know that I'll want to read this one -- sometimes I just want a reliable fantasy, flashy more in its sweeping style than in any innovative genre-pushing elements. I love companion stories, too. And I confess I'm a sucker for desert settings. I'm curious whether the cultural elements rang true to you, or just seemed like the typical Western portrayal of this region? Robert, you say the novel is told in first-person narrative...I find this style very appealing, as my favorite books I told in this style - Cook's Black Company novels, Zelazny's Amber series, and Hobb's Assassin Apprentice books. Would you say that the narrative style is comparable to the authors above? It sounds like it might be too restrictive considering that you said many of the supporting cast seem one dimensional and you find some of Dabir's actions not fully explained. Were there any "Wow!" moments? Does the book keep you turning the pages, or did you need to have breaks to get through it? Just curious as I am very intrigued by this book. Regarding 'wow' moments, I'm not sure if there are any that qualify, although I really enjoyed their journey in Ubar and meeting the Keeper of Secrets. On the other hand, I was also never bored or felt like giving up on the book. I'm not sure if this make me shallow but I'll this book just because of the cover. I love the color palate, the imagery, the border, font; everything. It also sounds like a fun read. Fantasy that isn't so heavily rooted in western European culture and history is rather hard to come by. Good concise review I thought. Been looking for Arabian Nights-themed fantasy novels after reading the 1000 Nights and being fond of Sinbad movies. Not very many to choose from. There is a fantasy adventure novel called the Amazing Voyage of Azzam about a Sinbad-like sailor looking for a treasure of King Solomon, but you can probably count the number of such works written in the last decade on one hand.